The Canary Islands are a melting pot in every sense of the word, and the best part is it always feels like summer, with long daylight hours and no extreme cold or heat. Here are some of our favorite island outdoor activities no matter the time of year. A visit to the archipelago off the coast of Africa wouldn’t be complete without spending some time on the water, and there are plenty of options to do so. Hop aboard a traditional Canarian fishing boat or a luxury yacht for a morning or afternoon of dolphin and whale watching in the seas around Tenerife (it’s common to spot whale mothers with their babies) while learning about these majestic mammals. Sun-seekers can opt for a catamaran cruise from Corralejo to the beaches of Papagayo in Lanzarote for a day of swimming, snorkeling, jet skiing, or simply relaxing in the sun. 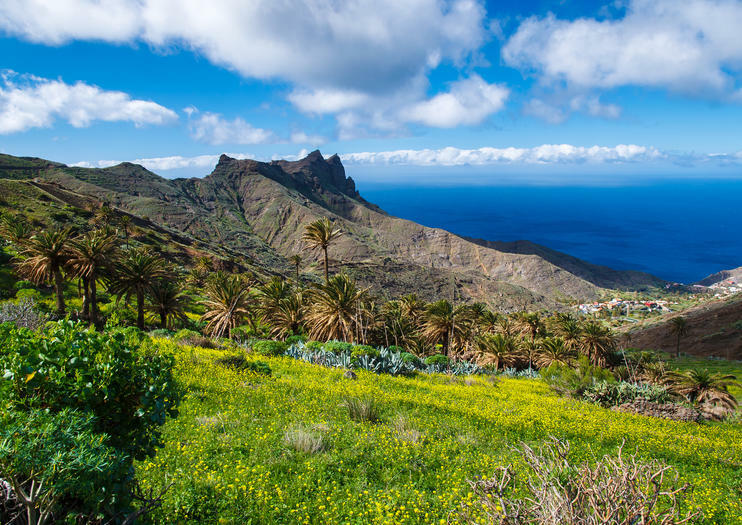 Rightfully famous for hiking, the Canary Islands have something for just about everyone. Led by a local guide, make your way through Corona Forestal Natural Park and into the red rock-strewn landscape of UNESCO World Heritage-listed Teide National Park on Tenerife, home of Spain’s tallest volcano. A cable car ride to the 11,663-foot (3,555-meter) lookout point on Mt. Teide offers an ideal vantage point for sunset watching or stargazing, and marks the start of a more challenging 30-minute hike to the volcano’s summit. On the island of Lanzarote, head into Timanfaya National Park for a walk into the crater of Volcán del Cuervo, where you might spot a rare barbary falcon. The varied landscapes of the Canary Islands make them a popular spot for alternative modes of transportation. On Lanzarote, get behind the wheel of a buggy for an off-road adventure past whitewashed villages, beautiful beaches, and volcanic landscapes. On Gran Canaria, the rolling Maspalomas Dunes (Dunas de Maspalomas) and lunar landscapes are best explored the traditional way, from the saddle of a camel. The waters off Tenerife’s Costa Adeje provide a critical habitat for sea turtles, and mild weather and excellent visibility make the area a prime spot for snorkeling, where it’s possible to see not only Canary turtles but also many other colorful marine plants and animals in their natural habitats. Those who want dive deeper into the marine ecology of Tenerife can opt for a specialty scuba diving course in fish identification, led by a certified PADI instructor. Explore the seas around Tenerife with this 3-hour cruise on a small group (only up to 11 people) in a genuine and tasteful sailing boat. Enjoy snacks and drinks on board as you watch dolphins and whales swim by. The capitan of the boat is an experienced local sailor who will asnwer any questions about these spectacular animals. After lunch, provided on board, take some time to jump on the water and swim or snorkel. Discover the magic of Tenerife at twilight with an unforgettable evening visit to the UNESCO-listed Teide National Park on this 4-hour tour. Ride the cable car to the 11,663-foot (3,555-meter) lookout point on Mt Teide and sip sparkling wine as you watch the sunset over the Canary Islands from Spain’s highest peak. After a cocktail dinner of traditional Canarian foods (included), unravel the secrets of the night sky on a unique stargazing excursion. Explore the dunes of Maspalomas the traditional way on this 40-minute camel-riding adventure in Gran Canaria. Climb into the saddle and head deep into the Gran Canarian countryside on camelback with a guide. Along the way, enjoy the sensation of riding on the back of these gentle giants. Admire sweeping views over the rolling sand dunes, rocky ridges and rugged landscapes for which Gran Canaria is famous. Satisfy an appetite for adventure on an exhilarating off-road adventure to the volcanic landscapes and beautiful beaches of Lanzarote. Choose from a selection of durations of up to 5 hours then climb aboard a powerful buggy to discover whitewashed villages and curvaceous coastal roads. See some of the island’s most spectacular spots as you drive an off-road vehicle and enjoy a personalized experience on this small-group tour, with numbers limited to 12 people. Absorb the serenity of Lanzarote’s picturesque wilderness on a half-day bird watching tour led by a professional guide. Travel in a powerful 4x4 vehicle over off-road terrain and admire spectacular landscapes as you head towards the bird watching mecca of the fertile island. Equipped with state-of-the-art binoculars and a telescope, scour the scenery for rare species like trumpeter finches, hoopoes and spectacular Egyptian vultures. Gain fascinating insight into the behavior and physiology of the birds from your expert guide, and enjoy round-trip transportation from your Lanzarote hotel. Discover the lunar landscapes of Lanzarote on an action-packed half- or full-day tour of the southern part of the island. Explore the natural sculptures carved by molten lava in the Timanfaya National park and witness demonstrations of fascinating geothermic activity. Experience an optional camel ride on the dramatic volcanic slopes then immerse yourself in the verdant beauty of La Geria winemaking region to pleasure your palate with refined local wine. Venture to the Janubio saltpans and El Golfo lake on the full-day tour, concluding with exploration of the Hervideros grottoes. Designed for active travelers, this moderate 5-hour hiking tour transports you to the ridge of the Monte Corona Volcano, home to one of Lanzarote’s largest craters. In a small group limited to 10, you’ll trek across lava-carved landscapes, gaze into the crater of the Monte Corona Volcano, and absorb panoramic views of the Canary Islands from the cliffs of northern Lanzarote. A medium fitness level and sturdy walking shoes are required. Hotel pickup and drop-off are included. Scale the summit of Spain’s highest peak, and look out over Tenerife beneath a blanket of stars. First, tuck into a delicious dinner of typical Canarian cuisine at Bodega Reverón in Vilaflor. Next, follow your guide on an evening tour of Mount Teide, then enjoy stargazing and spot constellations in the darkening night sky. Experience a day of luxury aboard a 75-foot (22-meter) catamaran. Enjoy a welcome Champagne toast as you depart then savor a buffet lunch and unlimited beer, wine, and soft drinks as you journey from Corralejo to the beaches of Papagayo in Lanzarote. Upon arrival, take to the water to swim, snorkel, or jet ski, or simply soak up the sun.